Tim Fremaux and Nate Baird from LADOT gave a brief implementation update reporting that LADOT installed a record breaking 101 miles of bike lanes within the past year, which is an impressive feet when judged relative to other bicycle-friendly cities. LADOT also announced some progress on a subset of the 40 miles of the ‘First Year’ bicycle lanes that were evaluated pursuant to the review process established under AB 2245. Of the 40 miles studied, LADOT announced that approximately 20.8 of new bicycle lanes in the Central and Northeast Areas have received procedural approvals and are ready to advance to the final design stage of implementation. These new bicycle lanes are seen as critical in completing the 2010 Bicycle Plan Backbone Bicycle Network for these areas. 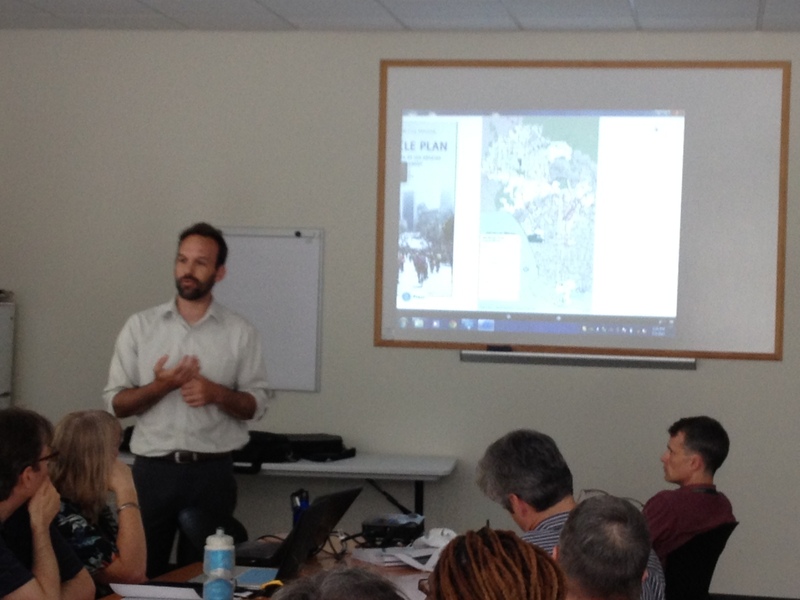 Nate Baird gave a presentation that described the varieties of bicycle-friendly street (BFS) treatments applicable to improving bikability on neighborhood streets and discussed their respective functions and benefits. Several of our partner agencies were also present. Deborah Deets from the Bureau of Sanitation’s Watershed Protection Division highlighted the potential of many of the treatments to provide benefits beyond easier bicycling and walking, such as treating and cleaning the City’s stormwater. I explained the objectives of a subsequent mapping exercise, which was to identify great neighborhood streets that should be prioritized, and propose BFS treatment for specific locations. 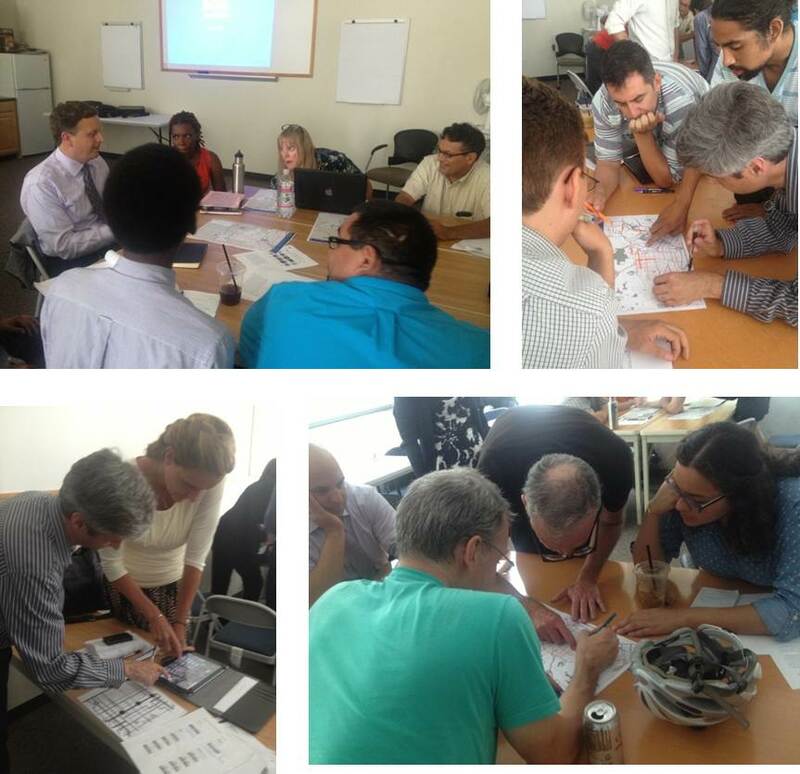 Afterwards, attendees broke into five groups organized around geography, and designed their ideal neighborhood bikeways utilizing the base maps provided. The maps included the following areas: Valley, West, Central-East, Harbor and SouthLA. During the exercise, attendees marked up the provided maps suggesting specific bike treatments at various locations. Examples included installing diverters, roundabouts and chicanes along neighborhood streets in Central and West LA, bulb-outs and roundabouts in South LA and similar intersection treatments in the Valley. This was just a first run of the neighborhood network planning exercise. Anyone interested is encouraged to download and mark up the base maps, and/or leave specific suggestions in the comment feed to this post. Or even better, organize your friends and neighbors to join you in the exercise! For this item, we reviewed the prioritization exercise of the last BPIT meeting where we asked participants to rank the highest priority programs, as well as program categories to implement from the 2010 Bicycle Plan. The top five categories included in order of priority were Safety and Education, Data Collection, Five Year Implementation, Design, and Maintenance. 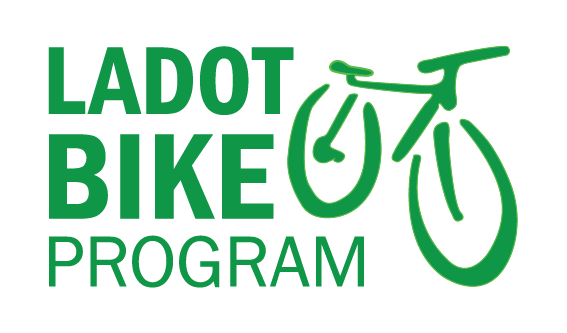 The top five programs in order of importance were Program 1.1.4A Bicycle Friendly Streets (BFS); Program 2.1.5F Violator Training Program for Motorists; Program 3.2.4C Bicycle Counts; Program 2.2.3B Share the Road Campaign; Program 3.2.4C Bike Counts; and 3.1.3D Traffic Study Guidelines Revisions. Staff noted that there are a number of initiatives already underway. 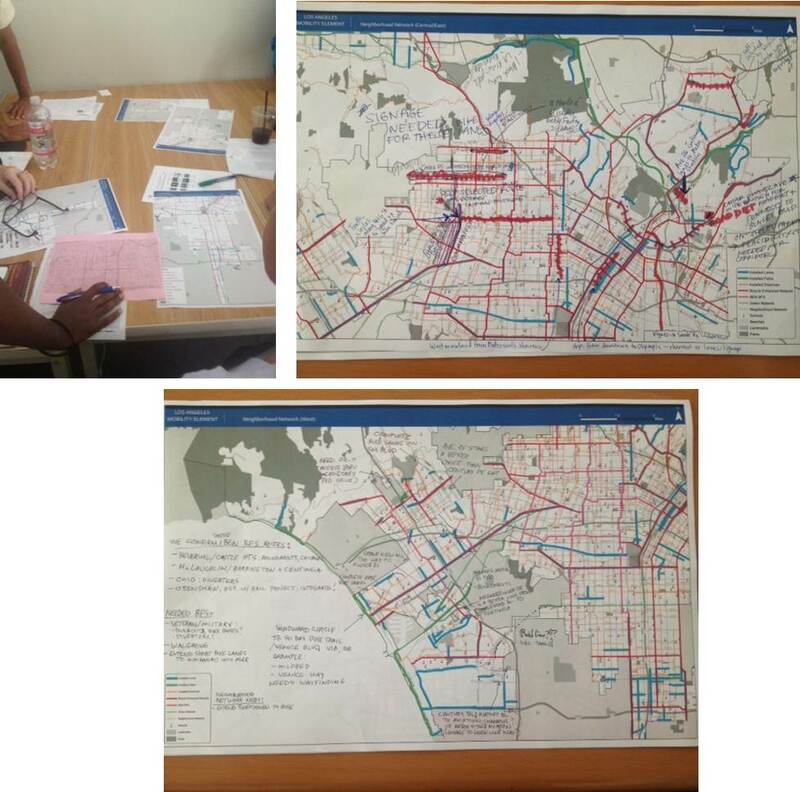 As part of a recently won Public Health grant, LACBC has hired a new staff member, Shanon Muir, to conduct outreach for identifying BFS treatments in South LA (partnering with LADOT and TRUST South LA). I also mentioned that DCP applied for a SCAG Sustainability Program Grant to evaluate traffic and economic benefits and impacts after travel lane reduction and bicycle lanes are installed in select corridors. It was suggested that the evaluation should be several years after project completion to give time to accurately assess the shifts in behavior in response to the changes. Recognizing staffing and resource constraints, prioritization helps LADOT and DCP staff to focus our attention to important program areas to implement in addition to the large milestones achieved in the record number of bicycle lanes installed in the City. Metro bicycle coordinator, Tony Jusay, was in attendance and reported that Metro is making progress on new bike hubs; Bike Hubs for the El Monte Station, and the Hollywood and Vine Station are in the design stages. The El Monte Station Bike Hub, scheduled for construction at the end of 2013, will include parking for 60 bikes, a bike repair stand and bike pump, as well as controlled access and 24-hour security cameras. There was also questions to Metro about the status of several bicycle program-related applications submitted under Metro’s 2013 Call for Projects. Metro staff recommendations, known as the ‘rainbow sheets’ for how Metro prints them on colored paper for easier navigation, were recently announced on Metro’s website, with several bicycle programs moving forward to Metro’s Board for final approval. Nate Baird also provided updates on the new program for bicycle repair stations and clarified LADOT’s application and funding process for bicycle corrals. A new assistant bicycle program coordinator was recently hired to assist in businesses outreach such as handling requests for new bicycle corrals. For the next meeting in October, it was suggested that there should be more outreach to the public through the citywide Business Improvement Districts and by word-of mouth. Thank you to all of those who attended the meeting, and we look forward to seeing you in October! Remember to download and mark up the neighborhood network base maps for the next meeting. I was at the meeting and spent most of my time with the Central zone people since I lived in that area for a while and am familiar with it, but I’m now a Valley resident and have some suggestions for my corner of the Valley. “Old Town” Granada Hills is a great little neighborhood commercial zone on Chatsworth Street between Zelzah and Louise, anchored on the west end by two large shopping strip malls. Traffic tends to be lighter in the whole area, and drivers (in my opinion) are more courteous and open to sharing the road with bicyclists. Unfortunately, because the traffic is lighter (and traffic lights are generally only on every major boulevard and not the cross-avenues), drivers are able to reach 50-60mph on mainly residential/commercial streets. I guess that’s not very courteous after all. Anyway, the northern section of the Valley has started getting really good bike lanes on major boulevards (thanks, LADOT! ), but the smaller avenues that have lighter traffic (but still faster traffic) can use some special treatment. Unfortunately, most of the streets I’m recommending would be defined as major streets because the “neighborhood streets” have been sliced and diced by the 118 and 405 freeways, washes, Metrolink and other major infrastructure in the Valley, cutting off easy routes on smaller streets. The major boulevards are, by default, going to carry the bulk of bike traffic in the North Val, especially because we have to travel farther to get anywhere. I would like to see San Fernando Mission Boulevard between Reseda and the border with the city of San Fernando receive bike lanes since this is a corridor that leads to/from the Metrolink station and serves several schools along the way (Kennedy High, Alemany) and neighborhood commercial zones throughout the eastern and central section. It is also a great corridor to and from Old Town Granada Hills. The eastern end is one car lane in each direction with a buffer on both sides of the street that can be turned into bike facility. On the western end, it turns into a residential street — again, one lane in each direction — and is wide enough to accommodate a lane on both sides. If that is not feasible because of parking (though most people don’t park on the street here), then I would like to see sharrows west of Louise with traffic calming devices. I think roundabouts would work well on the intersections with smaller streets that currently have stop signs. East of Louise through to the San Fernando city boundary, there is room for lanes in each direction. Secondly, I would like to see lanes on Chatsworth Street between Arleta Ave and Reseda to serve Old Town Granada Hills, parks, schools and LADOT Commuter Express bus lines. The street is large enough in most locations for a full bike lane. I think we’ll be needing more bike parking here soon. Thirdly, I’ve contacted LADOT about this and am trying to work with the neighborhood council, schedule permitting, but I would like to see lanes on Haskell between Chase Street and Rinaldi. There is a lot of bike traffic on this street (even more than Woodley) because of its proximity to Sepulveda Boulevard and as an alternative thereto because of much lighter traffic, and schools. Fourthly, Hubbard Street between Laurel Canyon and San Fernando Road – to complete the Metrolink connection. Fifth and finally (for now), Laurel Canyon between Rinaldi and Van Nuys Blvd, though I’d settle for between Rinaldi and Chamberlain because of the huge mess of freeway on/off ramps there if you also extend Fox Street from where it turns into Woodman at Chatsworth Street, to Laurel Canyon. See what I did there? I know that was a ton of requests, but implementing those would really help the North Valley get to work (Metrolink), shopping (Old Town Granada Hills/San Fernando commercial district), and school (at least a dozen if not more large schools in the area). I’m a recent convert to biking more simply because of the new bike lanes being installed all over the city, which has made me start to think that it can be a great alternative to driving everywhere. More lanes mean more people like me who are willing to make the switch (or at least use bikes more often for short trips). Many of these suggestions can be implemented fairly easily, in my non-engineer estimation. Thank you so much for your hard work. It is much appreciated in this household. Me again, for Central area this time. The only thing I really want to see implemented as Priority #1 in the Central area is turning Fountain into a bike boulevard/bicycle friendly street. I think diverters will help direct cut-through traffic onto Sunset and SMB where it belongs. Anyone who’s ridden Fountain will tell you the aggressive behavior of car drivers on that stretch. This was a big theme at the BPIT meeting among our group. Cars belong on Sunset/SMB and bikes need Fountain. Where Fountain turns into Hyperion, most people are saying that Hyperion at least to Rowena is a better location for bike lanes than Griffith Park Blvd since the commercial activity/destinations are on that street. So that was our group’s suggestion. All right, all right. Now I’m really done. Stay current on this important process…or be part of it. Changes we will have to live with. I did some calculations to find out the proportion of bike lane and path miles to the total street miles for some cities. Using the 385 miles of bike lanes and bike paths that Los Angeles now has installed moves the proportion of bike lanes/paths to total street miles up to 5.9%. With the exception of NYC, all of these cities have a higher bicycle commuting modal share than Los Angeles. Only Minneapolis and NYC had a much higher proportion of bike lane/path miles to total street miles in 2009 than Los Angeles now has. Its stands to reason that if you want to raise the mode share of bicycle commuters, then there must be a significant increase in the amount of public parking available in order for the rider to have a place to store their bicycle when they get to their destination. Both New York City and Los Angeles have a much lower amount of bicycle parking per 100,000 population than the other cities I listed above. NYC has increased the availability of bicycle parking in the last two months with the installation of over 6,000 bicycle share docking stations. The current average number of users per bicycle a day is about 5. That likely makes the number of different bikes parked per docking station much higher than a bicycle rack would have in a day. Chicago also recently installed a large bicycle sharing system which will increase the number of bicycle parking spots significantly in this city. With the exception of Los Angeles, these are the top five large cities for bicycle commuting modal share in 2011. Seattle makes up for some of the deficiency of on-street bikeways by currently having 2,800 bike racks on public sidewalks, or 908 parking spaces per 100,000 population. Which is more bicycle parking spaces per 100,000 population than Portland and San Francisco had in 2009. Los Angeles would need to have 17,398 bike racks on public sidewalks to match the amount of bicycle parking per 100,000 population that Seattle now has. Another even more extreme example of the importance of parking for a large bicycle modal share is Tokyo. There is less than 6 miles of on-street bikeways for this city of 12,000,000 people and yet it has a bicycle modal share of 16%. How is this accomplished? Most people ride on sidewalks with pedestrians along busy streets and on narrow residential streets with slow moving vehicles. A key ingredient for this large modal share is that there are 800,000 bicycle parking spaces. I mentioned Tokyo because they allow bicycle riding on sidewalks as does Los Angeles. Tokyo has 6,398 bicycle parking spaces per 100,000 population compared to only 153 for New York City–which does not allow adults to ride a bicycle on sidewalks. My point for mentioning this is that both New York City and Los Angeles have much larger amounts of bike lane miles per total miles of streets than any of the top five large cities for bicycle commuting modal share in the U.S. and yet both LA and NYC have a much smaller modal share. What’s lacking is not bike lanes, but parking. If you can’t find a convenient place to park when you get there, then this will discourage you from using a bicycle for utilitarian trips. Until the time when the city of Los Angeles has put cycle tracks along all of the 2,600 miles of collector and arterial streets there will be people riding bicycles on sidewalks–unless the law permitting this is changed. Paint treatments on busy streets is not enough improvement to lure all of the sidewalk riders to use the street. So what can be done to improve the safety for those that ride on sidewalks? I’ve observed a noticeable increase in the amount of space created between stopped vehicles at continental crosswalks and vulnerable users compared to the previous installed design. This creates a much less stressful situation for bicyclists or pedestrians who go through these crosswalks. This increased space also gives additional time to take an evasive action if stopped motor vehicle begin to move. Installing separate signal phasing for motor vehicles to turn left or right towards the crosswalk is another feature that would not only improve the safety for those using the crosswalk, but also bicyclists who are going straight through the intersection on the parallel street. Having this at several major intersections along the Orange Line mixed use path not only increases the safety for bicyclists and pedestrians, but it also reduces the level of stress for them. This is a safety feature that is commonly used at major intersections in the Netherlands and having used the Orange Line paths hundreds of times I can attest that it makes crossing an intersection much less stressful. Motorists behavior is usually quite different at crosswalks along the Balboa bike path that is parallel to Victory Blvd. Drivers will encroach on the crosswalk space and make their turn when pedestrians or cyclists are crossing. An important safety feature that is lacking along the Orange Line mixed use path is dedicated bicycle signals at those intersection that have separate left and right turn signals for motorists. This is needed because a person on a bicycle knows that they can get through the intersection under a don’t walk signal before the through traffic signal turns red. Yet the cyclists are usually unaware when motorists have been given a signal to turn across the mixed use path crosswalk. I have gone through these intersections on my bicycle under a don’t walk signal and have been in situations where motor vehicles are turning towards me unaware that I am in the crosswalk until they have just about completed their turn and are moving at a fairly high rate of speed. Expecting cyclists to simply follow the walk signals given to pedestrians is not understanding the difference between a person on a bicycle and a pedestrian. A bicycle rider is usually going a much greater distance and at a higher speed than a pedestrian, so expecting cyclists to make frequent stops at intersections makes their trip more annoying and time consuming. Bicyclist go through crosswalks on a don’t walk signal at a much higher rate than pedestrians. Again, that’s because the cyclist knows they can make it to the other side of the street before the light turns red. More bicycle parking spaces, continental crosswalks, separate left or right turn only signals and dedicated bicycle signals would increase the modal share for bicycling in this city without taking away road space for motorists. Allowing people to ride a bicycle on sidewalks is not likely to go away, so why not make improvements to crosswalk safety for bicycling in coordination with what the pedestrian coordinators are doing to increase the rate of cycling along major streets.